What is on your mind whenever people talk about Hainanese food? Is it always the typical Hainanese Spring Roll? Or Hainan Chicken Rice? Well that's what I always thought of until I dine at the Hai Nan Town (海南) Nyonya & Hainanese Cuisine that has been around the town for so many years. Hai Nan Town (海南) Nyonya & Hainanese Cuisine is located at Tanjong City Marina, Weld Quay area and next to Muchacha (formerly known as QEII). Hai Nan Town (海南) Nyonya & Hainanese Cuisine can be easily spotted if you are drives into Weld Quay from Esplanade. You will see a beautiful classic building located on your left before reaching the Penang Ferry Terminal. Being one of the coffee-selling businesse, ECC Coffee opened its first branch in Penang. The same location was formerly Starbucks Malaysia Gurney Tower, and not has taken over by ECC Coffee that emphasizes on the quality of coffee as well as some creative flavoured coffees, teas and other beverages to cater to the different demands of Penangites. ECC Coffee has added a little something to Penang as they focus on selling their coffee and also encourages customers to purchase their coffee beans, instant coffee and ready made teabags. After ECC Coffee took over this slot, the cafe has became slightly bigger and more comfortable to hang out at the cafe. Though all the non-stop eating, I do really concern about my own health and weight sometimes, or all the time. I'm really guilty after consuming carbo or all sorts of oily food and sometimes it is really out of my control. Recently, I was introduce to this brand called The Tea Factory that features healthy and beauty teas specially caters to all the tea lovers and health enthusiast. The Tea Factory offers a wide range of tea leaves combinations with their own recipes with different functions to suit all needs of customers. For the time being, The Tea Factory does not have a shop yet but they can be found in most events in Penang. It is manufactured and also packaged in Penang and now available in Occupy Beach Street event that happens every Sunday at Lebuh Pantai (Beach Street) Penang. I believe most of you are pretty updated on the social media and this recently....!!!! There's something that went too viral that even attracted people like me! It is really tempting when I saw the photos of the lobster noodle and eager to try it. Craving for fresh & juicy Seafood feast? or what about a pot of hot boiling steamboat for dinner? 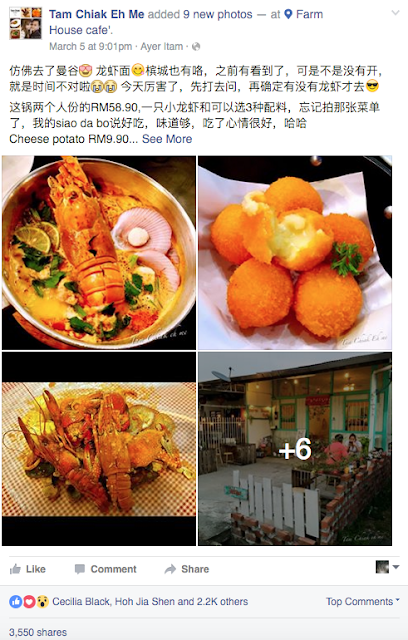 Now you can have them both in the newly opened MingYuan Seafood Steamboat Buffet located at 1-Square, The One Penang. This place features fresh catch of the day as they are the supplier of their own seafood. MingYuan Seafood Steamboat Buffet emphasizes on affordable seafood steamboat buffet to feed all the hungry stomachs in Penang. MingYuan Seafood Steamboat is located at one corner of 1-Square, where you can see it if you go straight from Love A Loaf Bakery Cafe located at the same row. I'm really happy whenever I am recognized as part of the media team sometimes, especially when it comes to events like Media Appreciation Night of those companies who you have supported from time to time. It was such a great pleasure to be invited by the management team from Red Box & Green Box Karaoke to attend to their recent Media Night that held in Red Box Gurney Plaza. Many thanks to Red Box for extending the invitation, it was indeed an excited night filled with fun and laughter. To make this year's Chinese New Year even greater, Red Box & Green Box Karaoke celebrated it together with their 16th Anniversary being in Malaysia. The management also thank the medias for all the supports throughout these years by organizing this Media Appreciation Night for all the medias. There were food and lucky draw prizes prepared for all of us. It was a sumptuous dinner and the prizes were grand and amazing. Buffet food are usually attractive and looks really yummy. However, it is not a good practice for wasting food. Red Box also advised their customers not to waste food, only take what you need and what you can finish. There is nothing greater than a bowl of al-dente and bouncy ramen with some thick and rich broth for a meal, and all comes possible when you dine at Hokkaido Ramen Santouka located at the Tokyo Street (6th floor) of Pavilion Kuala Lumpur. Hokkaido Ramen Santouka was a surprise catch when I was walking around Pavilion's Tokyo Street area while hunting for lunch many years back. I remembered I can smell a very strong fragrant when I was walking around Tokyo Street and seriously attracted to find out where it came from. It turns out to be a rather normal looking Ramen Restaurant that is located right beside the famous Suki-Ya Steamboat Restaurant. During my recent visit to Kuala Lumpur, I've dropped by at Pavilion and decided to go for lunch at Hokkaido Ramen Santouka to ease my ramen craving. I was there in the late afternoon hence the restaurant wasn't too crowded. When I flipped through the menu, I was really attracted by this special dish on the menu. It was Awase-aji Ramen that looks really attractive to me. There are 3 types of broth in Hokkaido Ramen Santouka which are Shio, Shoyu and Miso Soup. What's special in this Awase-aji Ramen is the special combination of all three Shio, Shoyu and Miso in one bowl of ramen. The combination of the soup made a bowl of rich and thick broth that smells awesomely heaven when it arrived on my table! The bowl of ramen also came with sides of 2 perfectly cooked Japanese half boiled eggs, some crunchy bamboo shoot slices and 2 pieces of smooth and juicy pork Char Siew. I was really surprised by the portion of this Awase-aji Ramen that also came with a bowl of white rice and a small cup of tea. The rice serves as the purpose of when customers finished their bowl of Ramen and there is still broth left, you can pour the rice into the broth and continue to enjoy the dish until you finish it. But honestly, the whole set was a bit too much to me even I'm a big appetite person. I couldn't really finish the rice after the ramen. The tea was perfect after our big ramen meal that it smoothens our stomach and great to end the meal. You can also order desserts like green tea ice cream or mochi after your meal if you have space left in your stomach. Enjoying a hearty meal can be as simple as this, Hokkaido Ramen Santouka is in Pavilion for a few years and still running fine. I do hope that I can visit this ramen shop whenever I drop by in KL again. Address: Lot 6.24.03, Level 6, Tokyo Street Pavilion, 168 Jalan Bukit Bintang,55100, Kuala Lumpur. Are you a deals hunter? If you are, I believe you are not a stranger to all the websites that offer great deals like Groupon, Zalora, Lazada and many more. 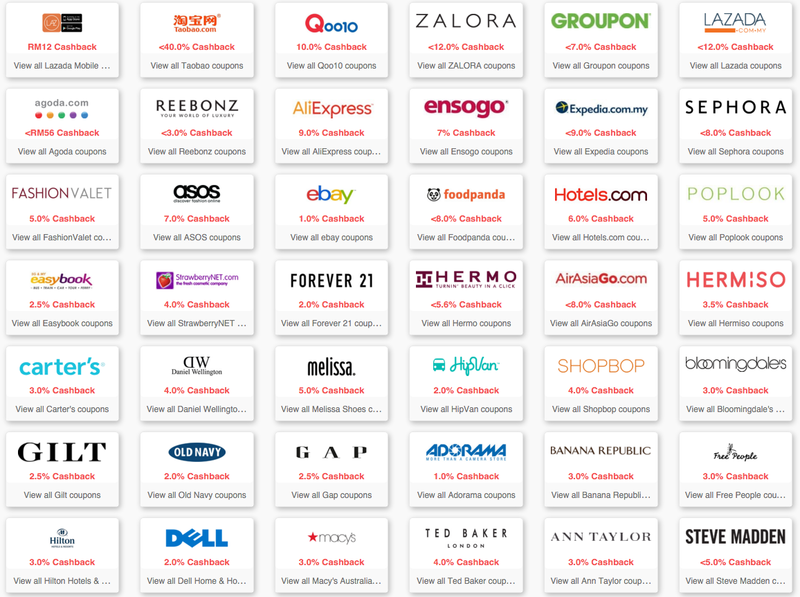 I believe all of us are the same, hunting for great deals, looking for discounts especially in a bad economy this year. We are all surviving with tight budgets yet we are all shopaholics. What if you can still get discounts from your current good deals that you found online? What if I were to tell you that other than those great deals, you can also get cash back for every of your purchases? What if I were to tell you all your cash back value are actually available in cash money? Now with ShopBack Malaysia, everything is possible! Don't you want to get cash back discounts when you book your preferred hotels with Expedia? Use can even use the latest Expedia coupons with your cashback? Shoppers get to earn cash when they shop online through ShopBack. It might sound too good to be true, but it is indeed a legitimate business model which took flight in the West. And now it is here, in Malaysia. How to shop and get cash back!? 1st Step: Log on to www.shopback.my and choose your preferred shops from over 500 online merchants available on the website. After you have signed up with ShopBack Malaysia and confirmed your email, you can officially start to shop and get cash back for every transactions depending on the offers available. Some could be 5%, or some could be up to 10 - 20% cash back discounts. 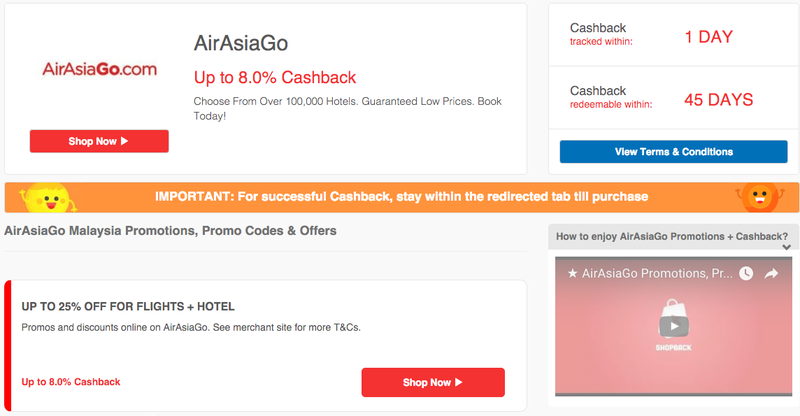 Imagine if you are booking a hotel room at RM200 per night and you are getting 10% cash back? You will get RM20 back in total! 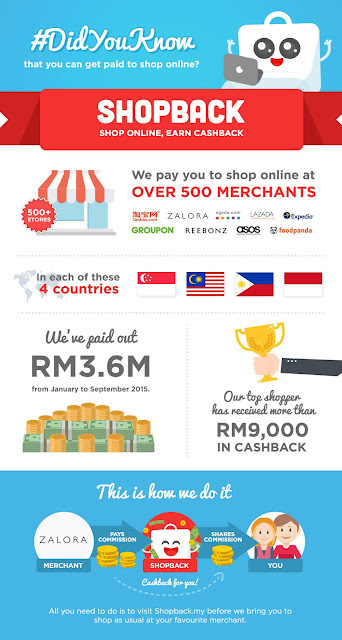 Merchants of ShopBack Malaysia are not only limited to food or fashion, but also includes travel, electronics, online shops and many more. One of the very IMPORTANT tips here I would like to tell all of you is DO NOT LEAVE YOUR REDIRECT PAGE. 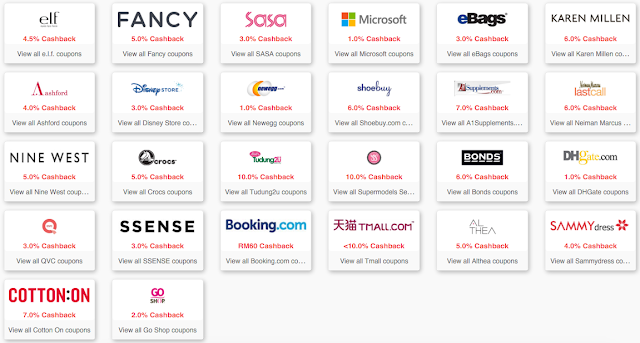 I believe some of you may be like me, who loves to see many tabs at one go, which may actually lead to failing in linking to ShopBack Malaysia and in the end you will not get your cash back discounts. Do not leave your original redirected page while you do your shopping so that you can get your cash back discounts towards the end of your transactions. Now tell me who doesn't love money? Well you should donate me your money if you are telling me that you don't because ShopBack Malaysia is giving back all the promised cash back money once the payment is made on their merchants' website. The cash back will be credited into the shoppers' account within a few days after the transactions. Unlike any other websites that has only restricted you to use the cash back money to spend in their websites nor just limited to Paypal credits. Once your cash back funds are credited into your ShopBack account, you can withdraw the money through your local banks like Maybank, CIMB Back and many more shown above. 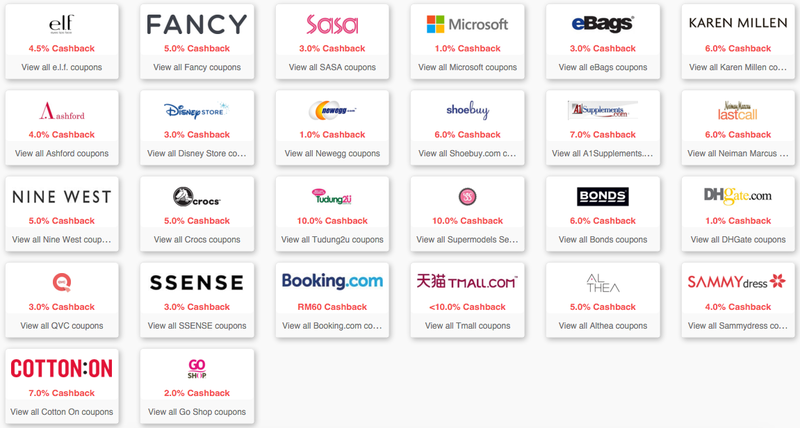 So, let's start earning cashback on your online shopping with ShopBack now! After my first visit to Parmanands Tailor Penang, I paid my second visit to the same place just to get myself fitted for a set of suit & trouser for certain occasions. Parmanands Tailor has since then became the first tailor that came into my mind whenever people asked me about formal clothes. I would really suggest them to Parmanands Tailor instead of going for brands because other than quality assurance, you can never find any other better prices that can offered by Parmanands, not any other tailor that I have came across so far. In Parmanands Tailor, they have all sorts of fabrics to fit customers' requirements. Whether is it wool or cotton, they have a sorts of fabrics available in store that there must be some that you would like them. And of course, everything comes with a price, if you are looking for high quality fabrics, the price would be charge accordingly, but nevertheless, it is the skills of the tailors that matter most when it comes to tailor made clothes. You don't want to fit yourself in a oversized suits nor over-tight suits either.